In the Light of Evolution is a collection of essays by leading scientists, and includes essays by science writer Carl Zimmer, historian Janet Browne, and a foreword by journalist David Quammen. As Quammen says in his foreword, the book collects "reports from the field, plainspoken descriptions of lifetime obsessions, hard-earned bits of wisdom, and works in progress, pried loose from some of the most interesting, eminent researchers in evolutionary biology..." It is a book "for readers who are fascinated by evolutionary biology and who desire to understand better the day-by-day, speciesby-species, ecosystem-by-ecosystem texture of its practice as a scientific profession." 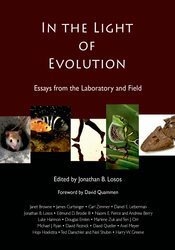 The book is intended for anyone with an interest in evolution, and it can be used in a wide variety of courses, including major's and non-major's introductory biology and evolution classes.